R&B songstress Elle Varner serves carefree curl perfection for the cover of Hype Hair March/April 2019 issue. She's also bossing up with her own label and sophomore project "Ellevation," which is set to drop later this spring. Inside, we chat with beauty about leveling up, hair must-haves and the power of loving her natural curls. 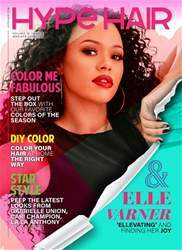 The issue also includes interviews with beauty blogger Naptural85, Madea’s Family Reunion actress KJ Smith and men’s corner featuring Sammie, along with your monthly dose of hair and beauty tutorials, hot products and style galleries.